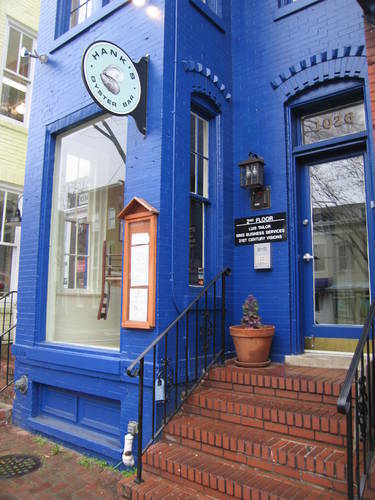 When we heard that Chef Jamie Leeds was selling CommonWealth Gastropub in Columbia Heights to focus on an expansion of her original Hank’s Oyster Bar, our thoughts turned to the only one of her restaurants unaffected by the news: the second Hank’s in Alexandria. While there are some restaurants we haven’t written about because we don’t have many nice things to say, our silence regarding Hank’s is more a reflection on its role as a solid go-to for oysters, seafood and even brunch in Old Town. We rarely plan our visits, so we don’t tend to have a camera with us when we stop in for a bite. Now you know we love good oysters. You’ve heard us tell the tales of Oyster Riots passed, and we shared our love of the oyster happy hour at Johnny’s Half Shell years ago. So you can understand at least part of the reason we’re happy to keep coming back to Hank’s. But the menu, with its daily specials and its emphasis on classic preparations of fish and seafood, has offered us plenty of reasons to visit beyond a few briny morsels every now and then. A few of our favorite things from the sea after the jump. Let’s start with those oysters, shall we? 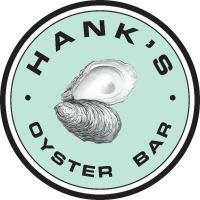 I’ll be honest with you – the first time I saw local Virginia oysters on the menu at Hank’s, I was completely stunned. In my limited experience up to that point, I was aware of three general areas where oysters could be found: the Pacific Northwest, New England (stretching up into Canada) and the Gulf of Mexico. These days, it’s not all that uncommon to find a Dragon Creek or a Chincoteague at just about any raw bar, but I’ll always remember the ones from Hank’s as my first. On most days, Hank’s offers a half-dozen varieties of oysters from across the country. Order them on the half-shell and they come cleanly shucked in a bed of ice with the traditional accompaniments (cocktail sauce, mignonette) for dipping. And if you’re an early bird, you’re doubly lucky – oysters are only $1 apiece from 5:30 to 6:30 Tuesdays through Fridays. While you’re scanning the board to find your chosen oysters, take a look at the daily specials. This ever-changing array of dishes is a testament to Chef Leeds’ skill with seafood. You can always expect to find a small plate, an entree and a fish of the day among these menu additions, and they run the gamut from grilled octopus to a full-on seafood Cobb salad. If the day’s specials don’t do it for you, there’s always the main menu to fall back on. And what a shame, to have to fall back on their ceviche, bisque or ever-popular lobster roll. And on weekend mornings, you can start off your day with a truly spicy Bloody Mary and a crabcake Eggs Benedict or a shrimp and scallop omelet. There’s no dessert on the menu, but the kitchen does send out chunks of dark chocolate with your bill. Of all the dishes we’ve tried at Hank’s the one that has least done it for us was their version of a fried oyster po’ boy which just ended up tasting hot and greasy when we tried it. Hank’s is located on King Street between Patrick and Henry Streets, and you can bet that they’re crowded most nights – especially during peak hours. 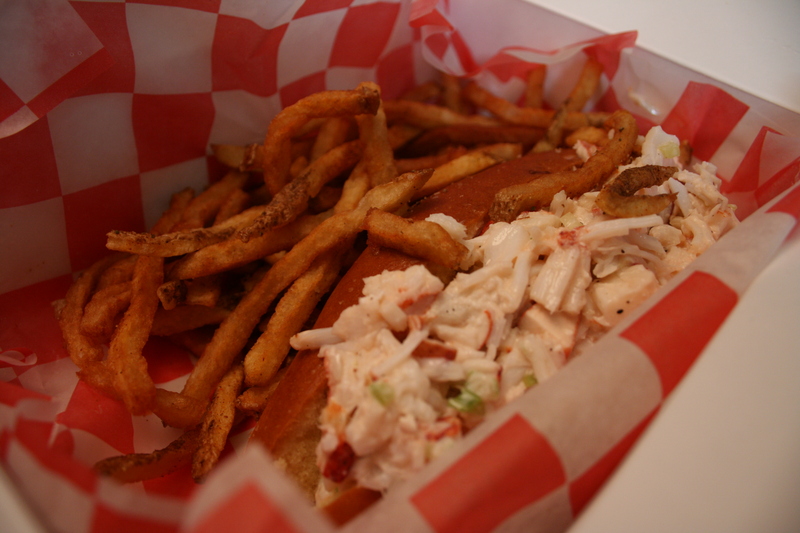 While prices can run a bit high (a $23 lobster roll is a splurge and a rarity), they seem to have developed a loyal clientele (like us) who will keep coming back. My last two trips to Hanks in Old Town have been disappointing. The oysters were small and iodiney. And yet right up the street at The Fish Market, they’re plump and briney. Different sources maybe? Sorry about that, Simon! As we mentioned in the post, one of our biggest problems when it comes to Hank’s is that we rarely plan ahead when we find ourselves there. That means no camera to take photos worth posting.